Chris Alvarez joined the ABC 30 Action News sports team in August 2015 and is thrilled to be working in his hometown of Fresno. A Clovis West and Fresno State graduate, Chris returns home after stops in San Francisco and most recently Palm Springs. His passion for sports began from an early age when he would broadcast games while playing sports with his two younger brothers Zach and Jake in the front yard. Chris played baseball and basketball at Clovis West and continued his baseball career into college where he played at Fresno Pacific University for two years. Chris graduated from Fresno State, earning a Bachelor's Degree in Mass Communication and Journalism with a Broadcast emphasis. 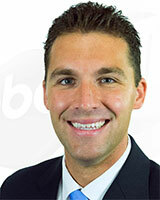 After college, Chris moved to San Francisco to work at Comcast SportsNet Bay Area. In his 3+ years, Chris covered the Bay Area's biggest sporting events and athletes, produced features and hosted web videos. Then it was off to the Southern California desert in Palm Springs, where Chris served as the Sports Director at KESQ (ABC) and CBS Local 2. While there he covered everything from high school sports, to the annual PGA and LPGA Tour stops and the BNP Paribas Open tennis tournament. When he isn't working or watching sports, Chris spends his free time working out, listening to music, improving his cooking skills, using FaceTime on the iPhone and catching up on his favorite TV shows and movies on the DVR. In front of 9,155 fans, the Grizzlies gave the fans something to cheer about with a 5-4 win in 10 innings over the Reno Aces. Baseball is back in downtown Fresno! The Immanuel Eagles took the floor at the Golden 1 Center in Sacramento Saturday afternoon with their sights set on a Division-IV State Championship and in a game that went back and forth, the Eagles fell just short.